This one came with my recent Nordstrom order, and I must say it was legit. I mean, I felt like trying it on my face as opposed to tossing it into "the sample grave". I guess I do not like anything that doesn't come with proper container of a sort, but I can see AMOREPACIFIC has made an effort to help us at least "learn" about this cushion compact. The whole experience matters when it comes to beauty products. Yeah. I don't intend this post to be a full review, because it wouldn't be fair. I just figured that we all could use some more swatches on the internet, so here goes. 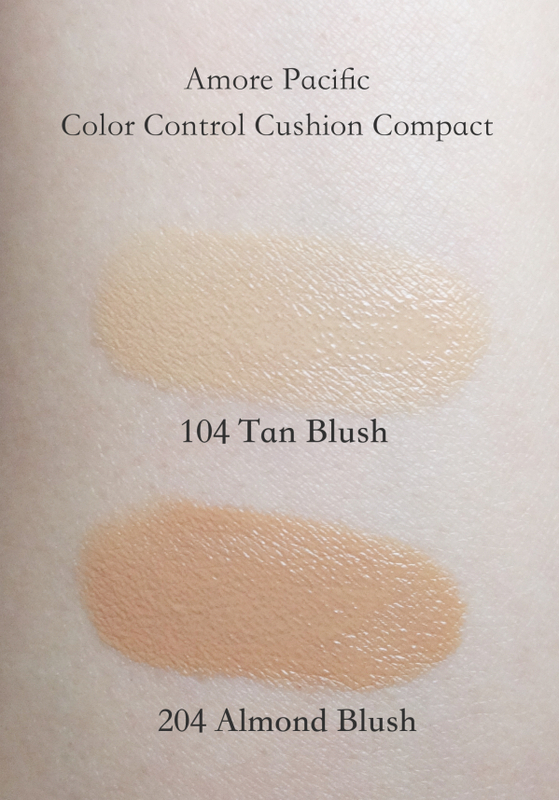 The sample pack contains 104 Tan Blush and 106 Almond Blush, and both have pink undertones. 204 Tan Gold and 208 Amber Gold supposedly have yellow undertones. This tiny puff is rather lovely in my opinion. Although it is ridiculously small to function properly, it seems the company did try to include "the whole experience" in this sample pack. This dark blue colored applicator that absorbs very little product yet dispenses evenly isn't really new since it has been around for years even before this cushion compact trends, but nonetheless essential to apply the unique liquid formula. 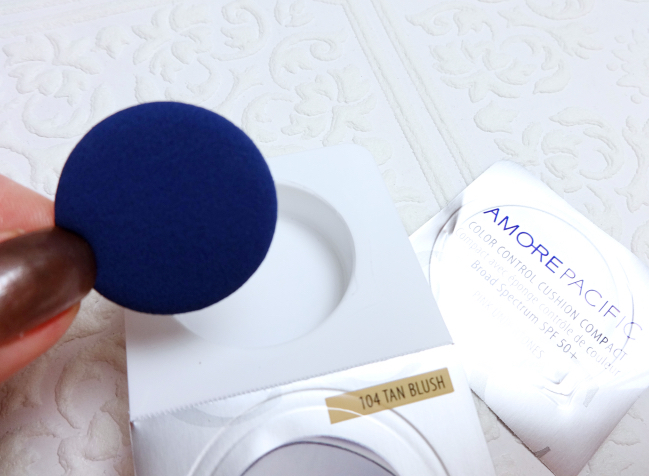 As I suspected from the name - Tan Blush, it was much darker than my skin tone. Bummer. Tan blush isn't all that pinky, though. As you might have guessed, Almond Blush only touched my arm for swatching purposes. I still went ahead and applied the Tan Blush on my face somewhat expecting the color would adjust itself. It did not betraying the product's claim to "color control". For what it's worth, the color wasn't completely foreign once it set. Good thing is that I really liked how it applied on my face. It had the light and cooling sensation and wasn't all that sticky as I had worried. Most of all, I loved the application didn't interfere with my sunscreen layer not to mention it would double as a touch-up compact with an effective sun protection. AMOREPACIFIC is marketed as a luxe brand here in the U.S., and basically is the motherboard of Laneige, Mamonde, IOPE, Sul Hwa Soo, etc. 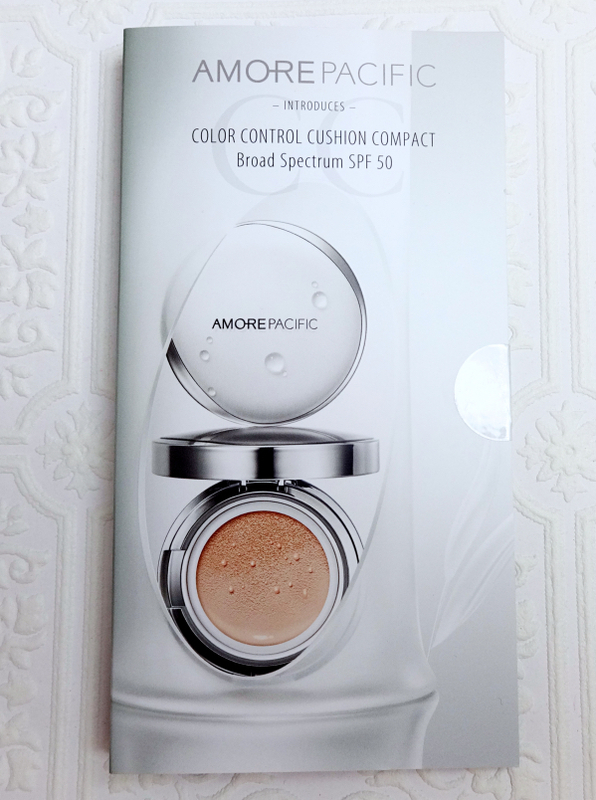 The finish and the wear of this foundation makes me feel even more curious about Korean cushion compacts in general, and at this point my mind is set to try one from either Laneige or IOPE. However, it makes me wonder how they came up with these color selections. For example, the Laneige BB Cushion Compact is available at Target (quite reasonably priced, I might add), but they also come with the similar color range that looks limited. From what I've seen and compared, these selections are completely different from what's available in Asia. Which is only natural to think about it, but I still find myself in the same dilemma even after this Korean pharmaceutical giant has landed in the U.S. I am afraid my first cushion compact would have to be obtained from an oversea online source, yet again. 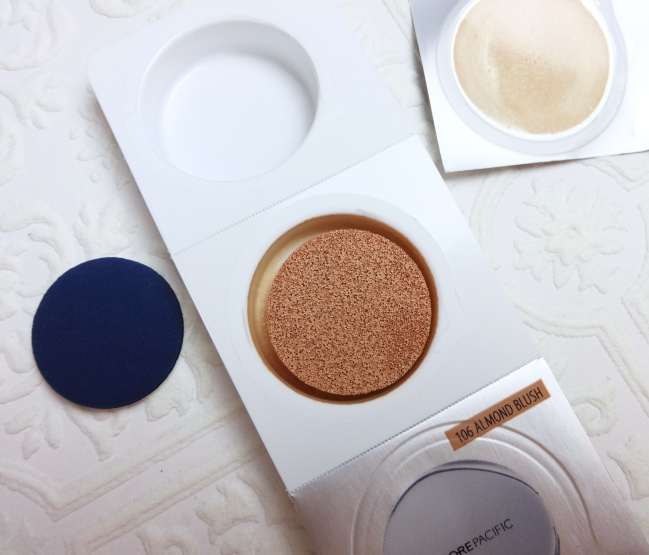 Have you tried cushion compacts marketed in North America? How do you find their color selections working out for you? I have the same sample and the tan blush worked well on me. But my skin tone is significantly darker than yours. I did find it adjusted to my skin tone, and had thought it would be too light or too cool. But I really liked the finish. It may adjust within the range. I think what you said makes a great sense because it looked natural in its own way although I still looked tan wearing the shade. 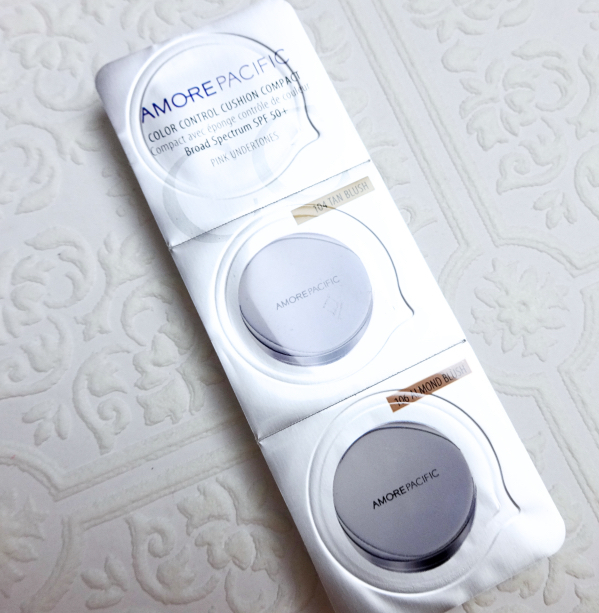 I really liked the finish as well, and hope the other cushion compacts (more affordable ones) are as good since they are from the same company. Aw what a cute little sponge and sample set! Hehe might be good to keep around for concealer or something down the road. I only have the IOPE BB cushion. It's a little light but I get by on it in the winter. This sample is adorable - I wasn't expecting a mini puff like that! Agreed! - and me, neither! I agree with you. If not a lighter yellow based color, the range still missing the equivalent of classic ivory, etc. I wonder they try to market this for base for bronzed look since it come with higher SPF numbers? I still can't figure out. Hey Lena, thanks for the review! I'm most probably between the two Gold shades, which means I probably wouldn't get this. The only cushion foundation I've tried so far is the Lancome one, but that was hardly a success so I haven't felt the need to buy more! The color match is the single most important factor to consider when I purchase foundation. Which is why I am determined to look into the Asian lines. what a cute little sample set. It is so interesting to see shade selection so different from the Asian and N. American market. Whenever I shop for Asian brands, I am always on the darkest shade of their spectrum(which I am a MAC NC25-30). I have tried both IOPE and Laniege and much prefer the IOPE one. Isn't it adorable? I still think they should have included a paler shade than Tan Blush whether it's pink or yellow based. Tan Blush is actually quite yellow. Which is nice. Too bad it was still too dark for you though. And icky smelling, lol :-) Other than that the formula does sound nice. I wouldn't describe the scent "icky" since it is still a nice cosmetic fragrance. Maybe too typical and strong. I was more surprised that they have kept the same fragrance for all these years. And yeah, the color range leaves much to be desired. I'm so glad you shared this Lena! I've been using the IOPE cushion compact in C23 and it's becoming a better match for me now that I've shed my winter pallor ;p I quite like the control of coverage of it. I was curious about the Amore one but not a fan of the $60 price tag. Yeah I hear you about the shades. Have you looked at the Lancome one? There's one light enough for me here in Canada. I did pick up the Laneige one, but haven't opened it as I'd have to self tan to use it. I bought a Lancome one and sent it to my mother! LOL. I wanted to get one for myself when Lancome was having a sale but I passed thinking there were no shades good for me. It is nice to hear there is a light one avail! Whoa I'm so surprised at the shade availability. Usually I expect Asian brands to go with a limited range of very fair shades rather than deeper. I saw this at Sephora and immediately became all starry-eyed for it! But since I had never tried a cushion compact before, I decided to buy one from their more affordable sister brand Etude House (which, for what it's worth, has the same shade ranges available in NA and Asia I think). I know, right? I suspect they took it a bit too far thinking everyone here wants to look tan or something? Do let us know how you like your IOPE one once you start using it! The thing is I don't think they will have the same color range out where you live. Such inflexible marketing, if you ask you. I don't know how cosmetic companies decide these things when they go global. I mean, L'Oreal is confusing (and upsetting sometimes;;). Laneige gave out some samples with the same tiny sponge and I totally wanted one just for the sake of it. LOL. I have a sample of Sulwhasoo's which came in a tiny tub with a generic sponge which was still pretty good! 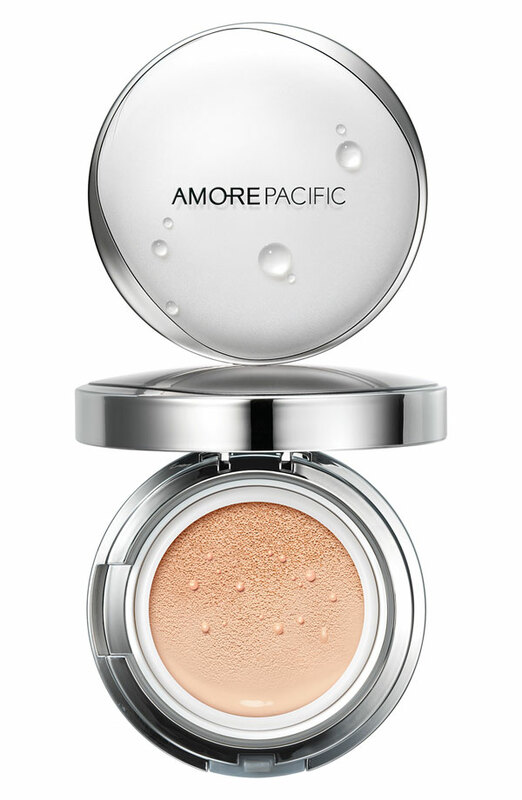 This AmorePacific is next on the list to swatch in person. I also want to get my hands on Hera which I've heard is more moisturising and long lasting? But again the colours for both seem really, really limited. I've swatched the Lancome cushion foundation and I think the second lightest shade was a good match for me. Maybe have a look at the Lancome one because they do have a wider colour range! Ah, Hera! I like Hera, too. The truth is they are basically the same only different in scent, packaging. Higher-ends like Hera and Sulhwasoo have a few more ingredients that are supposedly good for skin or something. They tend to be more moisturizing as well because they target over 30 and above. Interesting! When I had it put on me at Nordstrom, the rep asked if I wanted to go paler than my actual skin tone like the Koreans do, or whether I wanted a close match. I asked for the close match but didn't ask what the shade was because at the time there was no way I was spending $70+ on a base. I think she put that Tan shade on me but it ended up looking a little on the pale side regardless, and Arianne (The Glitter Geek) said none of the shades from Sephora were dark enough for her. Anyway, I love that you got the full experience with that mini sponge (the sponge is EVERYTHING). I'm thinking of getting this in about ten years after I finally finish everything else in my stash, lol. I do want to get at least one of those cushion compacts but also am much interested in the new Paul & Joe gel foundation. My mother loves the Lancome one I sent to her but she loves anything Lancome and Chanel, so her opinion doesn't count(?). Still Lancome seems to have most color choices avail. This is such an interesting product! I've seen the Lancome and Amorepacific versions of it but I've been trying to be good and not spend any more money on foundations. I think it's a good idea to sample a product like this before buying the full-size - I'd be devastated if I spent all that money without being able to use it properly! I don't think a cushion compact should be this pricey any way since we get so little of it. Luckily there are many options in the $30-$40 range. That's a damn pity that a Korean company comes to America (queue the song "LIVIN' IN AMERICA! EYE TO EYE! STATION TO STATION! "-James Brown) and you're not able to find a color match?! I think it's time for an UPRISING. I feel so bad for the millions of people who can't find color matches and makes me so mad at cosmetics companies. If you're not going to offer a full spectrum - one that reflects the population of the country you're selling in, just get out of here and take your paltry suitcase of limited choices with you. Yeah, I don't think I'd buy any of these U.S. versions. The Korean color selections are way to pale and they had to add some medium/dark shades to make it here, which I totally understand. They should have add a few more in between, though. I also have this sample lying around in my sample drawer. LOL I gave one to a friend (I have a few) and she said she loved it. I myself have tried the Laneige version and I have to say I quite like the finish! It makes my skin appear so smooth but at the same time looks so natural. I have heard that Sulwhasoo makes the best cushion compact, though, which I haven't tried yet. Why? Oh the price!!! I hope you find the shades a good fit for you! I really liked the formula (minus the scent). I think they should have included a few more shades in between. How u get this samples?